If this is you and several hundreds of thousands of other people watching Teen Titans Go! 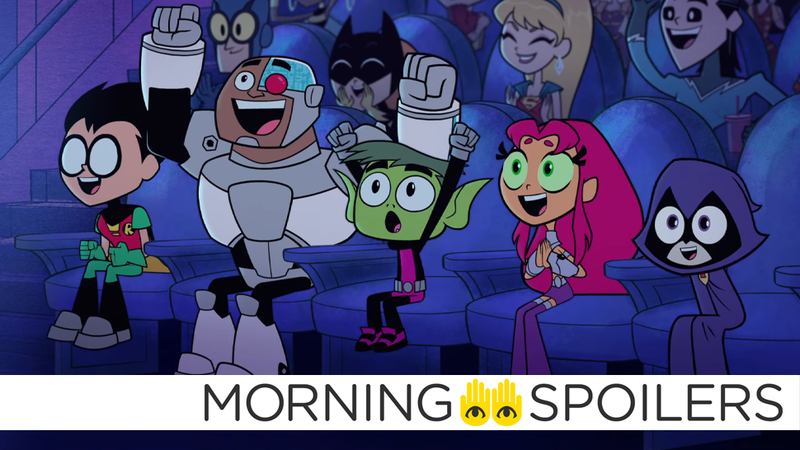 To The Movies, you could get the original Teen Titans cartoon back. There’s wild rumors about who could play the next Bond villain. Silver and Black is apparently going back to the drawing board. J.K. Rowling is already at work on the next Fantastic Beasts. Liv’s family could return in iZombie’s last season. Plus, what’s to come on Westworld and Preacher, and more Legion is on the way. Spoilers, go! Deadline reports Amy Seimetz has joined the cast of the Pet Sematary remake as Rachel Creed, a role originated by Denise Crosby in Mary Lambert’s 1989 original. Get your pinch of salt shaken, but not stirred, because The Mirror reports Helena Bonham Carter is EON’s top choice to play the villain of Bond 25. Sony has removed the Silver Sable/Black Cat team-up movie from their release schedule entirely. With Silver and Black, when you’re doing a film of that magnitude, it’s gotta be right. And if it’s not right, we actually collectively decided to go back to the drawing board and start over. That’s gonna take time. So obviously, I’d love to be shooting right now, but to be shooting something that I know is not as good as it can be, I’m not the type that wants to shoot something you’re rewriting, as you’re shooting. So, we have to get the script right, and I’m okay to wait. I may be shooting something before that, but it really is just get the script right before we go on that journey. Speaking with the Radio Times, Annie Potts revealed she’s already “done a lot of work” on Toy Story 4, but Pixar “threw out three-quarters of it” for a rewrite. [Toy Story 4] was supposed to come out this year and then they threw out three-quarters of it and rewrote. Usually, it takes – from start to finish – two years. But because they threw most of it in the bin and started over [my time on the project has] been extended a little bit. I’ve done a lot of work on it. During a Q&A on her website, J.K. Rowling revealed she’s begun writing Fantastic Beasts 3, the third out of a planned five-film series. I’ve just finished the fourth Galbraith novel, Lethal White, and I’m now writing the screenplay for Fantastic Beasts 3. According to Omega Underground, the long-awaited third Bill & Ted movie begins filming January 10, 2019. Chris Pratt has revealed to MTV that Guardians of the Galaxy Vol. 3 also begins filming in January of 2019. I’m slated to film Guardians of the Galaxy Vol. 3 in January, so we don’t know yet, time-wise, where that lines up. I’m hoping it’s not the last time you’ll see me [in the Marvel Cinematic Universe], but I can’t be sure. Fantha Tracks reports the film’s new working title is trIXie. You see what they did there? Ava DuVernay revealed on Twitter she personally approached DC about directing a New Gods movie. Speaking with Den of Geek, Bill Skarsgård stated the It sequel will be “a very different experience” than the first. It’s going to be a very different experience this time around, just given the fact that you have all of these incredible, seasoned actors to play against, as opposed to having all the kids. So it’s going to be a different experience for sure. But I’m looking forward to it. During a recent interview with Esquire, Chris Hemsworth stated Avengers 4 is “even more shocking” than Infinity War. If you were shocked by [Infinity War], I think the second one is even more shocking, for other reasons entirely. That’s what kind of blew me away the first time I read both scripts, is how they managed to orchestrate so many different characters but give them each their own separate shot and moments, and have it be elevated and feel fresh and unique - not just like a messy, thrown-together assembly of these guys. Speaking with Comic Book, Todd McFarlane once again confirmed his Spawn movie will not be an origin story. Nope. Nope. Nope. I’m not interested in the origin story. I can’t do it. I can’t do it. I’ve seen too many movies that spend way too much time for the set up. Given A Quiet Place came out and it starts with day 89, I love it. I love it. It didn’t go in any depth what happened in those first 88 days. I love it. So either you just go for the ride, or you don’t. Why do you think Wolverine was so popular? Because we didn’t know who he was for a long, long time. And that’s what made him cool. And you can argue that it’s like he became a little bit less cool, other than he’s Canadian, I don’t mind, but he became a little less cool once you actually gave the origin away, right? So, I sort of liked him when he was like a mystery. /Film has the latest poster. Speaking with TV Line, creator Rob Thomas revealed a scene featuring Liv’s newly-zombified mother and brother (who’ve been MIA since the season two premiere) was scripted for season four, but cut for time. Evan and Eva had gotten infected with the zombie virus, and they were having a gourmet, Liv-prepared brain meal — the first time that the mom and brother got to eat any brains other than tubes. However, the characters may return in season five. It hasn’t been a lack of desire on our part to get to it. The scripts are too cramped to open up that new avenue. But never say never. In Season 5, having some bit of resolution for that family is tempting, because they really have kind of fallen off the planet. If we do write a finale for them, they may not have gotten turned, because we may just try to feel what’s right in the moment. The Mikaelson siblings must work together to escape a pocket dimension in images from June 13th’s episode, “The Kindness of Strangers.” Head over to KSiteTV for more. Finally, Jesse comes home in the latest trailer for season three.